David Wang's commitment to giving minorities and other underrepresented groups a foothold on opportunity drives his support of Pardee RAND. David Wang calls them muddy-shoe assignments. Those were the jobs at International Paper Company that led to a big desk and a nameplate on the door—supervisory jobs at the muddy front lines of factories or forests. And Wang, an executive vice president, spent his career trying to get more minorities into those assignments to move them up the corporate ladder. That same commitment to diversity—to giving minorities and other underrepresented groups a foothold on opportunity—now inspires his support of the Pardee RAND Graduate School. His gift of $500,000 has allowed the school to provide diversity scholarships and expand its diversity initiatives. He and his wife, Cecile, are also members of RAND's Legacy Society, having pledged to the school an additional $1.5 million in their estate. Wang speaks from experience. He was born in China and moved to the United States as a teenager. He earned degrees in mechanical engineering and then worked his way up the ladder, through those muddy-shoe assignments, until he was a vice president at one of the largest paper-and-pulp manufacturers in the world. He retired from International Paper in 1991. His support of Pardee RAND dates back nearly a decade and includes six years of service on the school's board of governors. He was drawn to the school by its commitment to top-level research and analysis, and to applying it in the real world and not just in the classroom. That kind of rigorous, nonpartisan research has become especially important in this era of politics by ideology—what RAND's president, Michael Rich, has described as a national epidemic of truth decay. And that, Wang said, requires approaching problems from a diversity of viewpoints. His gifts in recent years have not only helped to support that wider perspective at Pardee RAND, but also aimed to raise the school's profile in minority communities. With his help, for example, the school has been able to launch a training program for faculty leaders recruited from historically black and Hispanic-serving colleges. It recently partnered with an international leadership organization, the Eisenhower Fellowships, to bring midcareer professionals from Africa for a three-day policy boot camp. The David I.J. Wang annual diversity scholarships attract minority students from nontraditional sources, to help get their shoes muddy in public policy research. 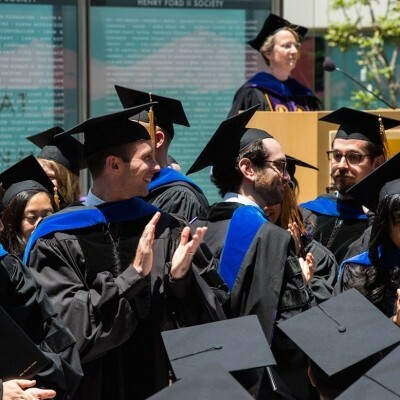 Additionally, Wang's dissertation funding is advancing students' work on topics such as homelessness in Los Angeles, the financial choices of college students, and workers' compensation for migrant workers—crucial issues for which RAND has no traditional research sponsors.